Wanting to dress for the job she wants rather than the job she has, actress Tricia, reached out to me to clean out her closet and help turn things up a bit on her summer wardrobe within her budget. So, I took advantage of some summer holiday sales to get her the best bang for her buck — where I saved up to 40% on lots of her items — and stocked up on loads of color, accessories, and bold pieces to mix and match with her current items to create outfits for both work and play. Have a favorite look? Tell me in the comments below. OUTFIT 1: Chambray :: her own, pants :: Zara, Shoes :: her own; Outfit 2: Blazer :: Zara, t-shirt:: Zara, Shorts :: her own; Outfit 3 :: her own, necklace :: Zara. Outfit 4: Peplum top :: Express, Pants :: Express, Necklace :: her own, Shoes :: her own; Outfit 5: Dress :: Zara, Necklace :: Zara, Shoes :: her own; Outfit 6: Blouse :: JCPenney, Skirt :: JCPenney, Shoes :: her own. Now is a great time to take advantage of summer sales. 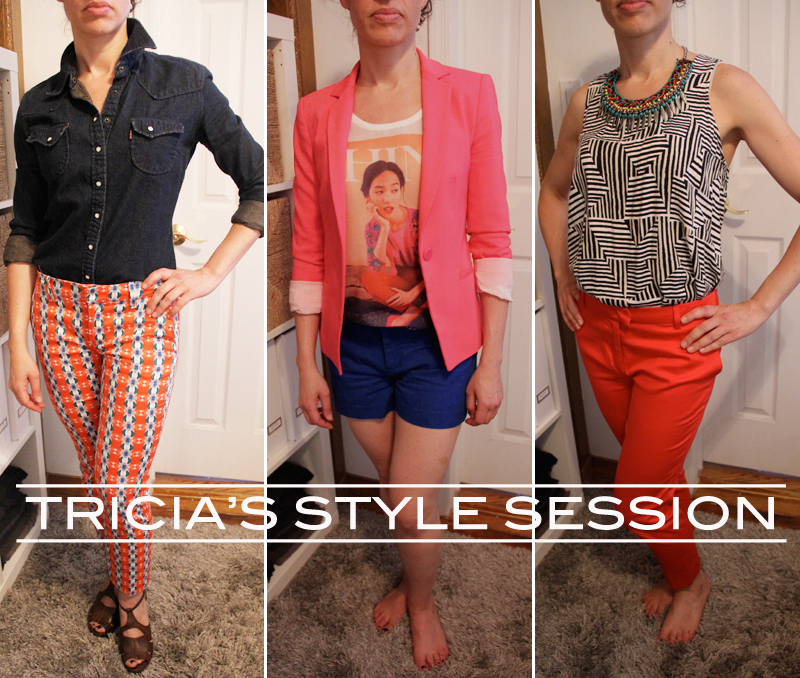 Want to check out another one of my Style Sessions? Click here. You know, for a long time, thrift stores have had this stigma of being these dark and musty places that were merely a graveyard for all the bad polyester and moth-eaten garments of yesteryear. But today, legions of people are seeing them for their true potential and revamping their closets on a budget. Need a little help navigating this world of fashion treasures? 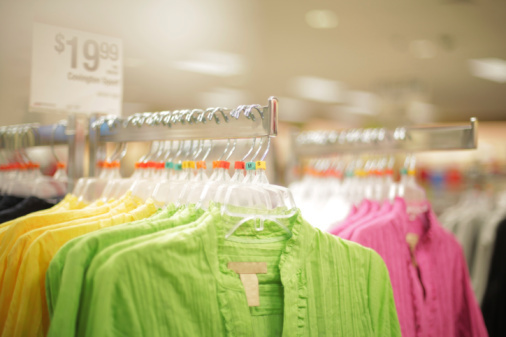 Here are 12 thrift store shopping tips from a shopping pro. 1. THINK OF WAYS TO REPURPOSE: I’d like to think that when you thrift shop, you are able to get some really cool and unique things if you put on your “creative goggles.” If you have the foresight to envision those printed bell-legged slacks as a tailored pair of matchstick pants, or how that plain jacket would look with a set of military buttons, you’ll surprise yourself with the possibilities out there. 2. KNOW THE TRENDS BEFORE YOU GO: You don’t have to plunk out tons of cash to stay up on the latest trends. To find out what’s current, browse magazines and window shop to see what’s popular before you go. That way, you can see what’s missing from your wardrobe and shop accordingly. Whether it’s an accessory or a color that’s hot, you’re sure to find ways to implement the latest fashion into your closet at a fraction of the cost. 3. ASK IF THEY HAVE ANY SALES OR SPECIALS: In my area, a lot of times the thrift stores have a day designated for certain items to be on sale. So if you’re willing to wait it out for that particular day, you may be able to get an item for an even lower price. 4. BRING CASH: Sometimes you’ll find that thrift stores don’t have credit or debit card machines, so it would be in your best interest to take cash. Also, with our recovering economy, I’ve found that you may get a better deal if you offer to pay for your purchase in cash, and save the store from incurring that fee for paying with plastic. 5. IF THERE’S NO DRESSING ROOM, IMPROVISE: In some thrift stores, there isn’t the luxury of a dressing room, so you have to get a little inventive with checking the fit. For things like pants and skirts, try the age-old neck-to-waist trick. Fasten the closure and wrap the waist around your neck, if you can just pinch the fabric together at the end with your fingers, then you know it works! Hey there, and Happy Monday!!!! I hope you had a wonderful weekend….I know I did. It was my birthday yesterday and I spent the day with people who love me –and I truly feel blessed. Okay….now you all know how passionate I am about thrift shopping. And, I’ve gone to the Housing Works BUY THE BAG Sale sooooo many times, and told EVERYONE I know about it (literally), that it was only natural for me to develop a relationship with those great folks, who are doing a really GREAT THING! So several months ago they did a promo video and asked me to be a part of it as a Frugal Style Expert, and I am so honored to have been a part of such an amazing production. Take a look at the video and let me know what you think below.